It’s November, the air is cooling and the mountaintops surrounding the Comox Valley are showing the first white whispers of winter. Christmas is on its way, ed and in the engine room of this year’s Santa’s Workshop, ‘Elves’ are settling into their annual two-month long quest to make Christmas a special time for the kids of the Valley. 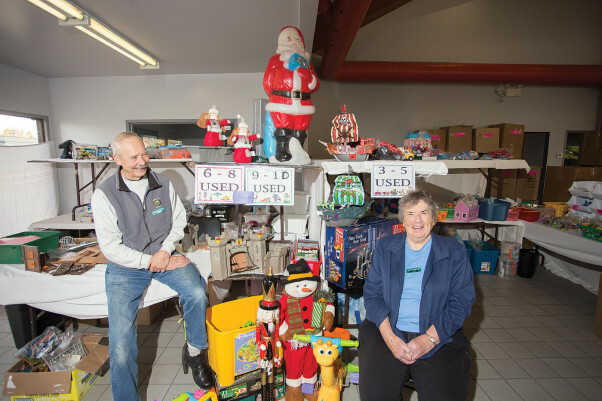 Stationed in the former Toyota dealership building off Cliffe Avenue this year, volunteers reunite in joyful spirits, sharing stories amidst a growing assortment of colorful new and used recycled gifts searching for new and loving homes. You may have noticed the “Santa’s Workshop” sign that appears across the front of an empty store or warehouse each November and December somewhere in Courtenay. This unique Comox Valley organization is a registered charity organized and run by Comox Valley volunteers with no paid employees or managers. Santa’s Workshop has been in operation for 42 years and offers help to local parents who have children between the ages of zero and 16 and are in need of some gentle assistance to make Christmas come alive. Workshop volunteers receive, repair, and restore gently used donated toys and then redistribute them to families in need from Buckley Bay to Oyster River. Santa’s Workshop was originally part of an organization started in 1972 by Doris Marlowe and others. The organization’s mission was to help low income and social assistance families rid themselves from the binds of social welfare. When government funding was withdrawn sometime thereafter, the program was slashed with only the Santa’s Workshop initiative surviving. It continued and was, for a time, conducted out of a garage by Marlowe and her daughters. In those early years, families received one gift only, a pre-loved commodity revamped to look like new. In 1994 the organization took the important step of becoming a registered charity, officially named Santa’s Workshop. But hard times hit soon thereafter, and the Workshop was almost forced to close its doors. Recognizing the need to band together, local service clubs—including Rotary, Legion, and Lions Clubs—and volunteers kicked into action, aided by the generosity of the old McDonalds building owners on Cliffe Avenue, who provided free rent for several years. By 2005, Santa’s Workshop had gained crucial momentum and expanded to 45 volunteers serving 375 families that Christmas. Supply and demand dictates the yearly numbers, so each year is different from the last. In 2014, Santa’s Workshop had 92 volunteers, and catered to 599 children in 271 families. Approximately nine out of 10 families are returning clients. The Santa’s Workshop process is simple and anonymous. Parents phone and make an appointment to come in and view the warehouse inventory. Appointments are scheduled for every 20 minutes through the first three weeks of December. By that time volunteers have near completed the lengthy task of cleaning, refurbishing and repairing of all the used donations. Volunteers are very aware of the fact that privacy is important, as many parents feel embarrassed to find themselves in a situation where they can’t provide toys for their children at Christmas. The shoppers must provide their children’s Care Card at reception, and then they follow a circular route through the warehouse accompanied by an Elf and a shopping cart. All of the gifts are arranged on tables and shelving according to age. Each parent can choose a used package, one “new” package, a bicycle, books and puzzles. They can also choose from an assortment of craft materials, stuffies, dolls and dress-up costumes for each child in their family. Typically there is a selection of large items, such as doll houses, play kitchens, snowboards and a variety of large toys and games all donated by Comox Valley citizens, and all ready to be enjoyed again by some lucky child. Donated toys that are not gift quality but still usable are put in an “as is” section that can be taken by any parent who wants them. Volunteers, most of whom are retirees, go through an orientation period when they first join and are mentored by an experienced volunteer. Each volunteer has a specific work area where he or she will usually stay for the two month duration. In November, large donation boxes are covered with Christmas wrap and distributed to stores around the Comox Valley by some volunteers. The working areas are set up in the warehouse and the reception area is set up with the computer and the phone ready for requests. 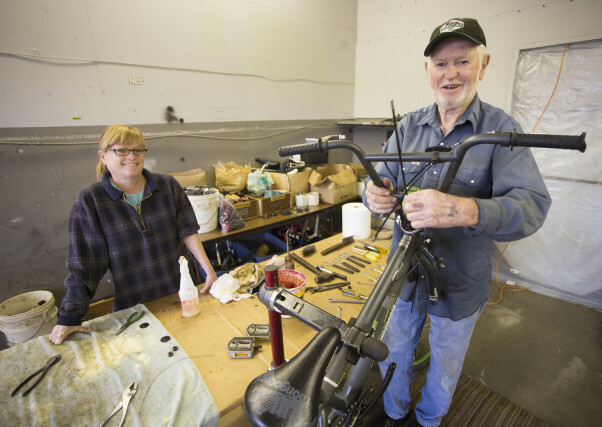 Another group of volunteers is in charge of a large area designated for bicycles, and others oversee the area for washing and drying and organizing shelves and tables for each age group. There are separate areas for cleaning and setting out story books, puzzles, activity materials, stuffies, games, electronics and dolls. All the books are carefully read page by page to remove marks and make sure all pages are intact and the covers are wiped down and cleaned. The puzzles are checked to be sure all the pieces are there. All the used toys undergo careful cleaning, washing, and refurbishing to return them to their best possible, ‘as new’ condition. A large part of the warehouse is taken up by the bike repair shop. The bikes are checked over and any that are not suitable for gifts are taken apart and the parts are sorted and stored in boxes ready to be reused. Last year Santa’s Workshop gave away 235 bikes. Each bike is stripped down and cleaned thoroughly, and all parts are checked and repaired or replaced, greased and oiled. 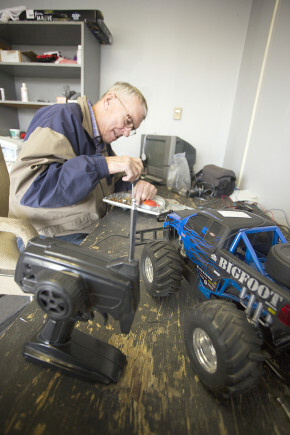 Battery-operated toys and electronics have their own small area. First, batteries and other materials are purchased, sorted and stored. As used toys come in they are checked to see whether they work or not and what needs to be done to make them work. They are tagged to indicate what batteries are required, then they are sent off for cleaning, and then on to the relevant age group area. Toys that can’t be made to work are sent to the “as is” section. As these new toys are sorted, workers start to fill individual packages. Each age group has a different cash value in their gift package. Older children’s gifts might include toques, gloves, sleeping bags, snuggle blankets, swimming towels, bathrobes, jewelry and makeup. The workshop also receives coupons for the movie theatre and the swimming pool. Once the items reach the required total, everything is placed in a large plastic bag so the contents can be seen by the parents coming to choose for their children. Testament to the generosity of the local area is the fact that Santa’s Workshop has survived for the past 42 years entirely on local donations. This includes voluntary hours, money spent to rent space—including both working space and storage space—and new toys as required. Large numbers of individuals, families and groups continue to donate a variety of new and used toys and everything is gratefully received. Sometimes children come to visit to personally donate birthday money or toys they have outgrown. Each gets a letter of thanks from the organization but otherwise they remain anonymous. People drop in or phone in to make donations and calls often come from some of the offices in town who regularly inquire about current needs. Santa’s Workshop often receives good quality items not suitable for children, and to continue the giving spirit they created a daily draw system whereby adult shoppers leave their name tag behind and at the end of each day one name is drawn. “The winner gets a neatly arranged basket of new or almost new items like books, kitchen materials, or whatever products we have that are simply too good to discard,” says Bernard. “Santa’s Workshop is very generous in giving ‘extras’ and even bikes to parents hoping to ride with their children. If they need something, and we have it, why not give it and make people happy,” he adds. And that’s precisely the essence of Santa’s Workshop—the entire community working together to share, create happiness, and provide a sense of belonging to those in need. The grassroots organization, full of smiles and laughter, truly embodies the giving spirit. It is tangible proof that kindness is all around us and real-life miracles still happen at Christmas.